Kate (Katelyn Elizabeth Beaufort) was born on the 11th of January 1834, her mother died a few days later. Her father was an earl, and she had five older brothers, but only two who survived infancy, and only one who survived childhood; the first-born, who was sixteen years her senior and therefore not any kind of a playmate. She was raised by a nanny, then a governess, and her father who treated her like a boy, spending most of her childhood in the Quantock Hills of Somerset. It seems to have been a somewhat lonely existence, her best friend a hound named Cinders, then a black retriever named Ebony. When Kate tried to join in games with lower-class children from the nearby village they often treated her unkindly, calling her names, pushing her into puddles, and generally excluding her from fair participation. Her education consisted of languages, geography, some natural sciences, classical history, and countless hours of committing poetry, quotes, and Bible verses to memory. 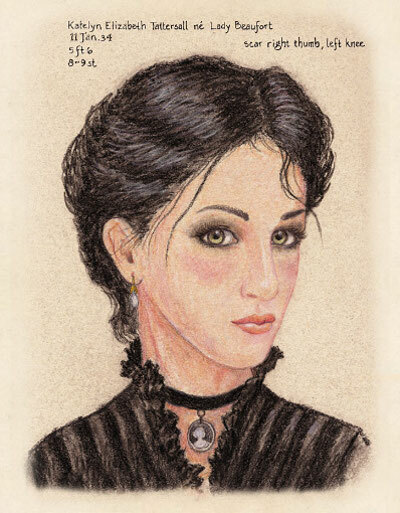 She enjoyed drawing, playing piano, harp, and guitar. 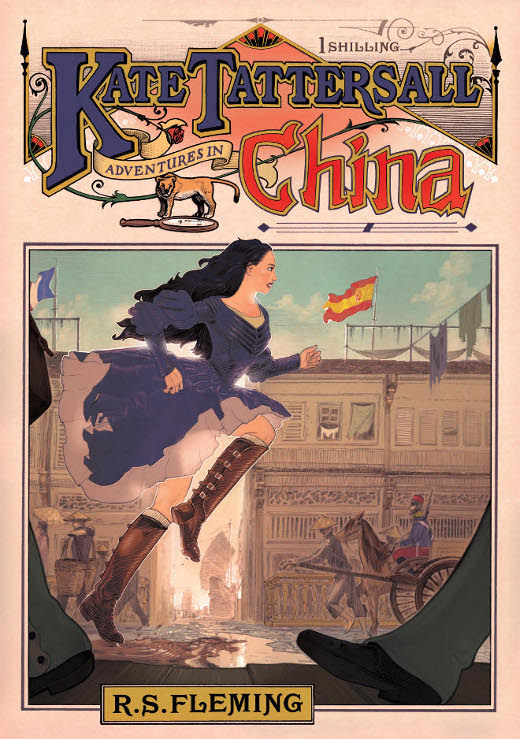 While wealthy people of the era all learned to ride, she went beyond most girls and actually straddled her horse and participated in wild steeplechase races. Still a tomboy at the age of twelve, but tall and graceful, she started receiving quite alarming attention from men. For a while she had a society tutor (decorum matron) who taught her a great deal, but also delivered some savage beatings. When she was fourteen her father remarried and Kate’s step-mother spent a year teaching her to act as a proper aristocratic lady. She then started taking a greater interest in fashion, honed her skills in sewing and knitting, and designed outfits that were tailor made to her specifications by an elite and very expensive dress-maker. Engaged, married and widowed all at sixteen, she had her daughter (Elizabeth Josephine) about a fortnight after turning seventeen. It was the untimely death of her husband which led to her becoming a dedicated operative in the British Secret Service. As was common at the time, she often left her infant daughter to the care of a nursemaid, then a nanny, then later with a governess. We only have this image that we suspect is Kate. It was found with her diaries and other items. 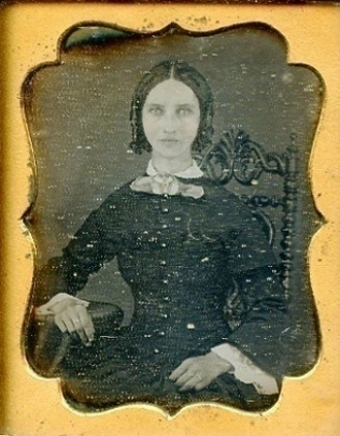 It is a very small 1/9th daguerreotype* (2×2.5”, 5×6 cm) plate probably taken in the Summer of 1853 when she was nineteen. It is housed in a battered leather case and brass frame. By this time she would have no longer been in mourning, although some widows remained all in black longer, or only went into half mourning after two years. The photo was hand tinted but has faded; there is pink on her cheeks and the flower, and perhaps some slight blue colouring on her dress. Her wedding band is visible on her left hand, and she is wearing another ring on her right middle finger. She wrote of having long unruly black hair, so here it appears to be carefully oiled for control, the front tresses curled and looped back, and tied with the rest at the back of her head. Large bright eyes, fair complexion, a long straight nose, thin face and slender body are all words she used to describe herself. When I first looked at this photo I didn’t think much of it. We managed to scan and enlarge it so we could see her better. This is quite tricky with a daguerreotype because they are like mirrors in direct light. Dust often got trapped behind the glass and caused the speckling seen here. Unfortunately air and damp has also leaked in between the glass and frame. The pink tinting for her face may have removed some of the details. However, it is still a decent image, and looking at other photos from the era, and comparing them to Kate, we realized she must have been very attractive. At 5’6” (168 cm) she stood taller than most women of her times, in fact that was the height of the average English man in the mid 1800s, but there are records of many members of both sexes being six feet tall or taller. Naturally healthy with an agile athletic physique, wearing the finest of clothes, she certainly would have turned heads effortlessly as she strode confidently and gracefully through posh London neighbourhoods. A fashion aficionado examined this image and suggested that Kate may not be wearing a corset, because her bosom would be flattened and pushed up higher. She probably has on some kind of simple stays, and there could be support (boning) built into the dress, that is tailored to fit tight on her midriff. The layers under her dress would include at least a chemise, stays or corset, and shirt bodice (chemisette). Women also wore little waistcoats to swathe their breasts, made of various materials, and known as camisoles, bosom friends, under vests, modesty wraps, or covers. While it’s true that these undergarments did lessen the details of a bosom, it also added volume to a small-breasted girl’s figure, which was a body image issue Kate wrote and worried about. (She may be wearing a corset with an under vest.) The lacy flared shirt sleeves which are visible, known as engageantes, were separate items worn with elastic above the elbows or tacked into the dress sleeves and removed for laundering. The sloping shoulders with dropped arm’s eye (armscye), neat little collar, cut of the sleeves, and flat pleating are all typical of the late 1840s to the mid 1850s. Women of that era desired an appearance of hardly any shoulders, and this dress certainly achieves such an effect. Also typical of the early 1850s is the centre parting and side ringlets. Women wanted their waists to appear about as big around as their heads, but Kate isn’t quite achieving that fashion trend. It was common for women to wear pads on the sides of their heads, hidden within their hair, then lace their corsets tight, and thereby produce an even balance in the width of their heads and waists. In this pastel rendering of Kate by Mia Lane, based on the daguerreotype, we get an idea of what she may have looked like in the Spring of 1850, sixteen years old and newly wed. Her hair would have been tied at the back of her head, and a bit of eye paint and red lip salve was fashionable. Her adornments are conservative; large tear-drop pearl earrings and a cameo tied at her throat on a silk ribbon. During this era sects of some faiths believed any cosmetics or jewellery was sinful, and revealed a lack of modesty, but not generally amongst the peerage. It seems the wealthy gentry, the growing upper-middle-class, were far more prone to strict puritanical beliefs, and that women should be home-bound “guardians of the hearth” waiting to fulfil their husband’s every whim. Kate certainly never fit such a description, her fondness for travel and adventure too great, but she did strive to be a devoted, caring, loving wife and mother. *The daguerreotype process creates a direct positive image on a silver plated copper plate, producing a mirror effect and is unstable; it can easily be rubbed off and will oxidise in the air, so daguerreotypes are mounted in sealed cases with a glass cover. Our image of Kate has unfortunately degraded. Congratulations on having one of the most sophisticated blogs I’ve come across in some time! Kate’s story is very interesting. Hey there! I’m a 19th century English lit fan, and this reads fantastic! Will your books be available in the US? @ Enid V, the e books will be available everywhere, and the printed books will certainly be available through the mail, if not at your local bookshop. I am really loving the theme/design of your site. I looked carefully at the photo. I think it has some yellow in the middle of the flower. Kate’s build and pose looks like the famous photo of Emily Dickinson; both slender with really long necks. @ Reggie. I think you’re right about the bit of yellow on the silk(?) flower. It appears to be a button or ring, probably pinning the flower in place. Part of Kate’s neck is hidden by her collar and the “sloped shoulder” cut of her bodice. I looked at the daguerreotype of Emily Dickinson and agree, they are quite similar. Emily’s was taken in 1846 or 47, and is in very good condition. Thanks for your observation. I like Kate as a heroine. You really make her come to life. I wish there were sites like this for all my favourite novel characters. Thanks!